BACKTIME: Baracking Bad Part 1: What Will 51 Bring? 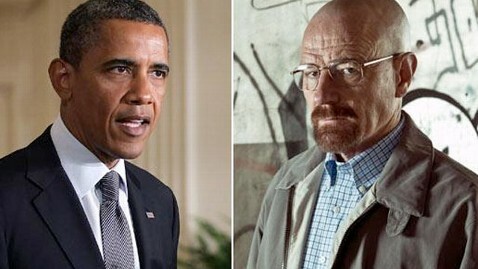 In a delicious, ironic twist, President Obama's 51st birthday comes one day before Breaking Bad celebrates Walter White's same birthday with an episode titled "Fifty One." It's got to be a conspiracy, right? Something to do with Area 51? Well there doesn't seem to be much mystery or secrecy about the man on the left and how he will spend his next year. It will almost certainly be in the same Residence, with the nation watching his girls grow up. The Real Clear Politics poll composite has Obama a slim +3.0 over Romney, with the number weighed down by the outlying conservative Rasmussen daily intake. The networks have also gone all in on the notion that the presidential race is coming down to the wire - as they are invested in the 24-hour news cycle and blowouts are bad for business. It's interesting to see two non-partisan numbers pop up in the last month: Pew Research had Obama +10 this week, and Bloomberg recently had him +13. But more significantly, Irish oddsmaker PaddyPower.com has the sitting President at 2/5. InTrade markets have Obama at +17.5 (in a 100-point share). That's not the be-all and end-all. On this exact date 4 years ago Obama's InTrade lead on McCain was +22.2, before an amazing but short-lived comeback by the McCain/Palin ticket who took a brief lead in the polls and the InTrade markets that were lost for good on September 18, 2008. And mathematical election guru Nate Silver of FiveThirtyEight has Obama about to run away with it, with a 71% chance of winning. That's the same odds he forecasts for the president in Ohio, while seeing a 87% chance of winning Pennsylvania and an 88% chance of winning Michigan. The electoral chances for Romney are described this morning by The Daily Beast's Michael Tomasky as "drawing an inside straight," and it's one where he'd likely need more than one card to fill it. So rest easy on your birthday Mr. President. Hit 'em straight on the golf course, have your wife prepare you some sort of nutritionally sensible cake, crack open a beer and enjoy the Olympics. Fifty One has a different meaning for me, so I'll throw on my Bernie Williams jersey and enjoy the Yankees/Ms game. We'll take a look back at Walter White/Heisenberg's journey from 50 to 51, and try and map out the road to 52 (we know he'll get there), when Baracking Bad Part 2 continues...tomorrow.